As a record collector, I collect records. Obviously, right? But as my friends say, there’s a message in there somewhere. In the course of collecting records, there are albums that get played once, twice, or for a season, only to be put back on the shelf, forgotten and neglected. Having bought a new turntable that’s a million times better than the toy of a record player I had before, I’ve played albums I haven’t touched in years. In doing so, I realized there’s a lot of mini-genres of jazz, and I’m not talking about hard bop verses free jazz. There’s ‘recorded at a night club’ jazz, or ‘Newport Jazz Festival’ jazz. With this new realization, I figured I would spotlight albums in these different sub-categories, partly because it’ll be interesting and fun, and partly because it’s a great way to rediscover my record collection! The first sub-category? Arranger jazz,! More specifically, jazz arranged for a small group of musicians. To the music! Fittingly, the first ‘arranger jazz’ record in this series was made on the West Coast. Ah, the West Coast. Swimming pools, movie stars. And, in the 1950’s, movie studios that provided day jobs for numerous jazz musicians. Many of those jazz musicians put that musical knowledge to work, writing and arranging tunes with varying degrees of success. This album features four originals by trumpet extraordinaire Clifford Brown with the arranging left to Jack Montrose. Montrose grabbed a few of the jazz heads that were in LA at the time, including two guys visiting from New York: Zoot Sims, apparently in LA for a change of scenery, and Clifford Brown, on tour with Max Roach. The music itself is historical, in that it features the first editions of “Joy Spring” and “Daahoud”. It’s also a rather interesting recording date because we get an ‘East meets West’ opportunity to compare the playing styles and the versions of the Clifford’s original tunes. Zoot Sims’ sound on the tenor sax was perfect for the West Coast sound and fits right in on this record. Smooth, not too light, but just right- classic Zoot. Clifford Brown’s rich, full sound on the trumpet also meshes well with the ensemble’s. You can hear the Pacific Ocean and feel the warm sun every time he plays. The rest of the guys in the group play admirably, carried by Shelly Manne’s always-firm drumming. Bob Gordon, baritone saxophonist and regular denizen of West Coast recording studios, gets the honor of blowing a chorus on “Joy Spring”. It gets awful close to elementary, and in some cases, banal. “Blueberry Hill” and “Gone With The Wind” are some of the worst offenders, which is a shame because once the head arrangements are out the way, the fellas can do their thing and the music picks back up again. Montrose’s use of the ensemble improves on the second side of the record, with the writing on “Daahoud” being particularly tasty. The latin tinge at the beginning is a nice touch. “Joy Spring” moves along joyfully, and sounds like a classic cool jazz composition in this setting. Cheerful, bright, and flowing. Compare these versions of “Daahoud” and “Joy Spring” to the versions recorded by the Clifford Brown/Max Roach Quintet a month later. Crazy fact. 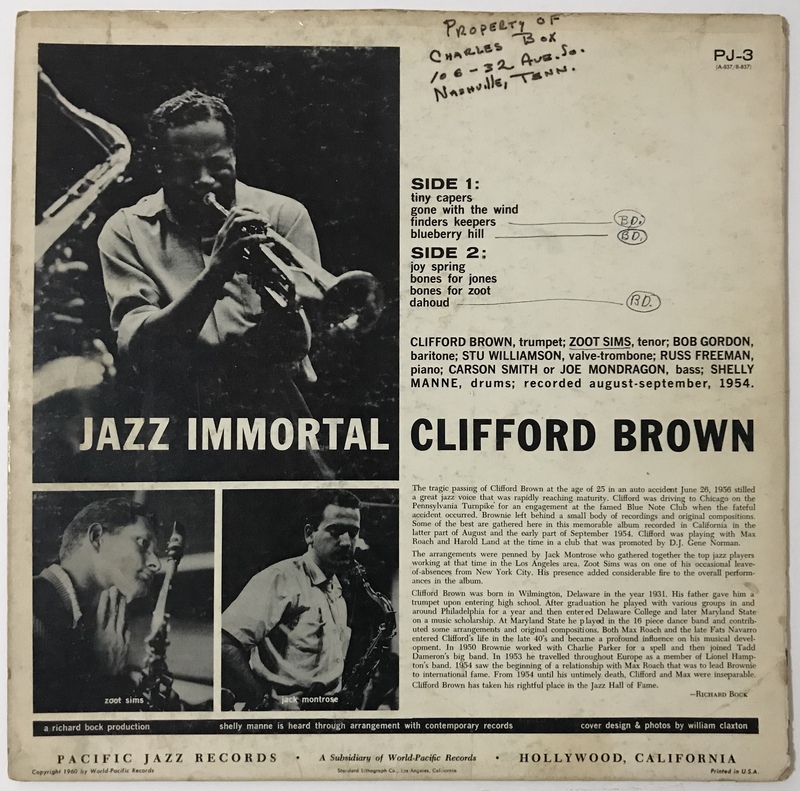 It’s widely known that Clifford Brown tragically died in a car crash almost two years after this record date while driving to Chicago. What’s not widely known is that Bob Gordon, also present at this record date, died in a car crash as well in 1955 on his way to San Diego for a gig. Mercy. The artwork itself is pretty minimalist, making for a striking cover. Really, this cover has all you need: The title, who the artist is, and the record label, followed by an expressive shot of the aforementioned artist. William Claxton’s stellar photography strikes again, with the saxophonist framing Brownie in mid-flight. It’s a famous picture of him. One thing that always makes me chuckle when I see this photo is his clothing. Looking at his hair and his high-waist pants, he looks like a grown man, not the 23-year old guy he is on the record. The cover itself has seen better days. It was a much-loved record in a different life. 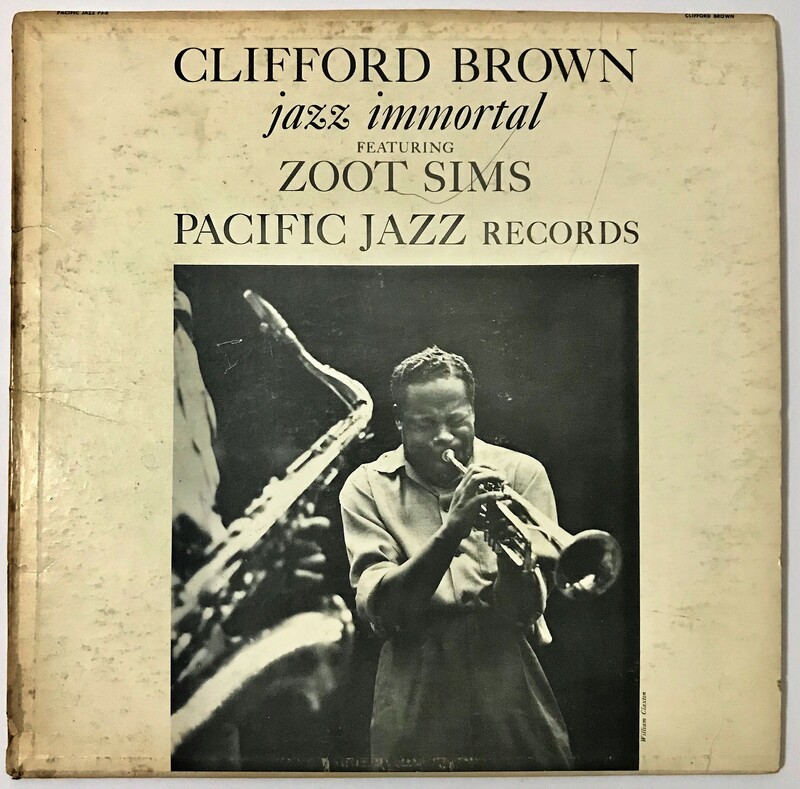 A brief set of liner notes by Pacific Jazz Records founder Richard Bock, most of it a bio on Clifford Brown, with only a couple of sentences dedicated to Zoot Sims and Jack Montrose. There’s a couple more nice photos on the back though. The previous owner of this record felt the need to add his address and name to the jacket. In case the record wandered off and got lost, I suppose. Originally, this album was released as a 10-inch record in the mid-50’s, then as a 12-inch in 1960. This particular record is a Japanese reissue from 1979, according to Discogs. The absence of a deep groove and the thinness of the vinyl matches a 1979 birth date. Despite being such a late pressing, the music sounds fantastic. Maybe the Japanese somehow got a hold of the original tapes? Richard Bock and Les Koenig over at Contemporary Records used some of the best microphones to record their musicians, resulting in legit high-fidelity records. The record has a healthy amount of snap, crackle and pop, but nothing too overpowering. Despite being recorded in 1954-era mono, it’s got some punch and bite to it- the way good mono should sound. I found this album a couple of years ago at the local record store, buried in the new arrival section amidst a slew of other classic jazz albums. The record store owner priced it at $4.00, which was well-within the college collector budget. Playing it on my upgraded system, it sure doesn’t sound like $4! Thank you very much , very nice and interesting work!